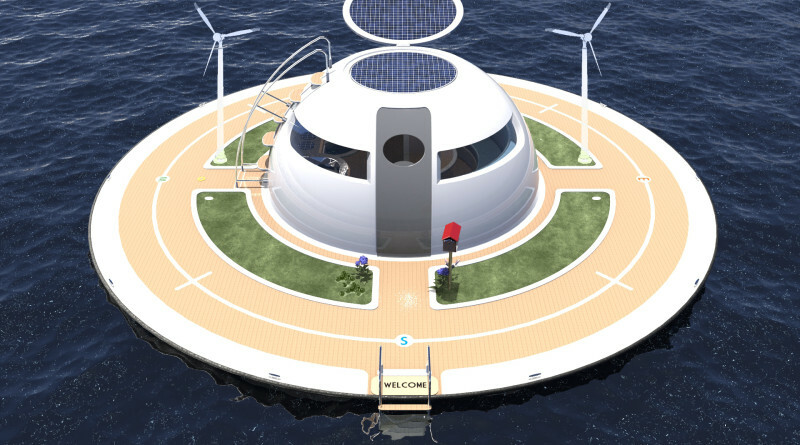 The UFO floating home was designed for the consummate boater who prefers living life on the water. ITALY — Jet Capsule, creators and masterminds behind the mini yacht, have revealed new plans for those who want to make a statement with their floating home. The company’s newest concept will definitely turn heads since the on-the-water vessel resembles a UFO. Company co-founders Pierpaolo Lazzarini and Luca Solla designed the Unidentified Floating Object to allow clients the freedom to cruise the world’s oceans while living a comfortable and sustainable lifestyle. An electric engine powers the two-floor structure; additional energy resources can be provided through optional wind and water turbines located on the top and below the main disk. The UFO’s main structure, according to company co-founders, can be aligned with the compass, keeping the position angle, oriented on the desired cardinal direction, even in rough sea conditions. “The UFO will maintain position and stability safely, thanks to a special elastic anchor system,” a Jet Capsule representative explained in an email to The Log. The floating home is composed from a floating disk, which measures about 41 feet in diameter and features two half spherical shells of fiberglass. A generator converts saltwater or rain into drinking water or to water the vegetable garden located on the deck. The UFO can hit a top speed of 3 knots. A kitchen, dining area and bedrooms are also located on the main and sub level of the UFO. Jet Capsule is looking for an investor to develop a first working prototype. Visit jetcapsule.com for more information.